Fiera's Michael Chan has also found select companies in industrials and in niche markets within consumer discretionary. Michael Chan, vice-president and senior portfolio manager at Fiera Capital, says that investors should not be put off by the relatively poor performance of Canadian small-caps so far this year, but rather focus on the excellent growth opportunities in this universe. "We have found select companies in sectors such as energy, mining, industrials and in niche markets in the consumer discretionary sector," Chan says. A long-time specialist in small-caps and a growth manager, Chan argues that the case for investors to hold a portion of their equity portfolios in small-caps remains. "There are a number of listed emerging Canadian companies run by solid management with a good track record of creating shareholder value that are currently flying below the radar." The S&P/TSX SmallCap Index, the Canadian benchmark for that market segment, was in slightly negative territory in the first five months of this year with a total return of -1.4%. This, says Chan, must be viewed in the context of the Canadian equity market, which did little during this period, with the S&P/TSX Composite Index chalking up a positive total return of only 0.3%. In the 12-months to the end of May, the small-cap benchmark had a total return of 6.2%. This was lower than that of the Composite, which produced a total return of 7.8% over that period. Chan and his colleague Michael Rabinowitz are responsible for Fiera's Canadian Equity Small-Cap Investment Strategy. Included in their mandate is Fiera Capital Equity Growth, an all-Canadian fund, which is benchmarked against the S&P/TSX SmallCap Index. The Fiera small-cap team's minimum market capitalization is $150 million, and early-stage companies in such areas as biotechnology and natural resources are not considered. As part of their discipline, Chan and Rabinowitz apply both quantitative and qualitative filters to their target stocks. 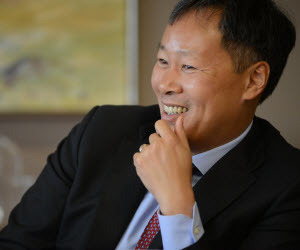 The quantitative metrics, says Chan, focus on a company's return on invested capital and a "clean" balance sheet, with the appropriate level of debt on it. The qualitative assessment favours those companies in industries where there are "attractive long-term fundamentals and barriers to entry." High insider stock ownership is also a plus, says Chan. This helps to align management's interests with those of the company's other shareholders." Valuation is a key consideration too, he says. "We look for new investments with a 50% upside over three years." On a monthly basis, the team ranks a universe of 100 target companies, including those already held. It then uses this ranking to shift the portfolio to the higher-conviction names and to eliminate those where it has the least conviction. Fiera Capital Equity Growth, with 60 holdings, is substantially overweight in the industrials and consumer discretionary sectors relative to the index. The portfolio is markedly underweight in materials and energy stocks, which together account for more than 50% of the small-cap benchmark. But the Fiera small-cap team has been finding select opportunities among the natural resource stocks. Chan is highlighting energy producer Kelt Exploration (KEL), in which the two managers recently added to their existing holding, and Ero Copper (ERO), a new name. "Both stocks offer a 50% upside over the next three years," he says. "We place considerable emphasis on management, and each company is run by a CEO with an impressive long-term track record." Kelt Exploration is a low-cost oil and natural gas producer with strong volume growth, says Chan. The company operates in west-central Alberta and northeastern B.C. "It has important assets in the prolific Montney formation in B.C.," he says. The company's CEO is David Wilson, who has been responsible for establishing, building and successfully selling a number of energy producers, says Chan. For example, he was CEO of Celtic Exploration Ltd., "which was sold to a major global integrated energy company in 2013 for $3.1 billion." A portion of Celtic assets were retained and spun off into Kelt Exploration. Formed in 2016, Ero Copper's main asset is a long-established mine in Brazil. A low-cost producer, Ero Copper expects to produce some 50 million pounds of copper this year and to more than double its production by 2021, says Chan. "Copper is one of the commodities with the best long-term fundamentals." Ero Copper's CEO is David Strang, "who has been in the copper mining business for many years, during which time he has established, built and sold several companies." An example is Lumina Copper, which was sold in 2014 for $470 million. Ero Copper Corp. Kelt Exploration Ltd.
*As of June 25, 2018. A new industrial name in the portfolio is Brookfield Business Partners (BBU.UN). This company, says Chan, is the private equity arm of Brookfield Asset Management (BAM.A). Brookfield Business Partners has access to the global financial expertise of the Brookfield group, says Chan, and targets such areas as business services, construction, energy and industrials. "Brookfield Business Partners has been producing solid investment returns from its holdings and is one of the few listed private equity companies in Canada." Also in the industrials sector, the Fiera small-cap team has added to the fund's holding in ATS Automation Tooling Systems (ATA). "This company is a global leader in industrial automation and is focused on health care, transportation and technology." CEO Andrew Hider, who came on board in March 2017, has been boosting the company's operational prowess and expanding its profit margins, says Chan. The company has interesting long-term prospects given its role in the field of electric cars, he says. "The stock has done well year-to-date, but there is still some upside." A consumer discretionary holding that the Fiera small-cap team added to at the beginning of this year is Park Lawn Corp. (PLC). "It too has done well, year-to-date, but there is still some upside," says Chan. Park Lawn owns and operates cemeteries, crematoriums and funeral homes in both Canada and the United States. "The company is a consolidator in this field," says Chan. It has been making significant and accretive acquisitions in Canada and the United States. "It is a growth business, given the demographics in both countries." By contrast, says Chan, the acquisition strategy of Uni-Select (UNS), which is also in the consumer discretionary sector, has not been that successful. The company distributes automotive paint, industrial paint and auto repair parts. It operates in Canada, the United States and the United Kingdom. Chan says that Uni-Select's acquisition of The Parts Alliance in the UK in the summer of 2017 has not produced the results that Uni-Select's management anticipated, and it has also put a lot of debt on the company's balance sheet. "Given these two negatives, we considered that our original investment thesis on the stock was broken." Two stocks in the materials sector have recently been eliminated from the portfolio because "they had declined significantly in our ranking." They are Major Drilling International (MDI), a driller to the mining industry, and packaging company Winpak (WPK). On Major Drilling, Chan says that the recovery in spending by the mining industry on drilling has been more modest than anticipated and the Canadian market, a key focus of the company, "remains highly competitive." Winpak, which has operations in a number of countries, is, says Chan, experiencing a squeeze in its profit margins. There is, he says, growing competition in its important U.S. market, and Winpak is facing rising input costs across the board.